When I first saw this kitchen designed by Wendi Young (via Desire to Inspire), it stopped me in my tracks. It sure did look familiar. Then it struck me–it was the “It’s Complicated” kitchen! Right? They look close enough to be sisters, anyway. They share the same basic layout (although the fridge is on opposite sides of the room). The beamed ceilings. The open shelving to the left of the sink. Similar lighting. Even the flooring looks similar based on the small glimpse we get of it in the movie. I love it! The set designer for the film was Beth Rubino, who also worked on Something’s Gotta Give (pics of that house here). To see the rest of the house that goes with this kitchen, visit Wendi Young Design. If you could have a kitchen inspired by one you’ve seen in a movie or TV show, what would it be? Hard for me to choose just one, but Nora’s kitchen would be at the top of my list. On Movie Mondays I feature rooms from our favorite films. To see my post about Meryl Streep’s house in “It’s Complicated,” click here. Meg Ryan's New York City Apartment in "Kate & Leopold"
.-= Janet´s last blog ..Muted Color =-. Beautiful kitchen! I love the farm table. Off to check out some more! I would pick the practical magic kitchen. I just love it. Too bad it’s long gone. I love that kitchen, but don’t think I could keep up with open shelving-I love being able to cram things in the cabinets when unexpected visitors stop by. I can’t imagine where I would stash things if I had open shelving. I drool over the kitchen in the TV show, Parenthood, but now I can’t remember the character’s names-it’s Peter Krause and his family. .-= rosie´s last blog ..Lego minifigs-edible edition =-. Oh that is interesting, yeah, they MUST be related! Very perceptive of you! I love the open shelving!! .-= melissa @ the inspired room´s last blog ..Living with What You Love =-. This is an ‘our dog ran through your yard’ level of intimacy, but I sold some of my natural linens to Nancy Meyers’ daughter. I feel I have a very vested interest in these lovely kitchens! .-= Tricia Rose´s last blog ..The Fence- TaDa! =-. I watched the movie last weekend again…just to watch the sets. And now I’m off to see the rest of the house that goes with that inspired kitchen! Thanks! .-= Kimberlee J.´s last blog ..The Butchart Gardens =-. If you asked me in 1990, I would have said the Home Alone kitchen. 😉 Back then, that was good lookin’ stuff!! .-= Amanda @ Serenity Now´s last blog ..Thrifty Treasures- Dresses for Less =-. Julia-Nora’s kitchen is my alltime favorite. I also wouldn’t mind the Home Alone Kitchen with updates 🙂 I remember liking the Somethings Gotta Give kitchen too ! This is hands down my dream kitchen! I love the house from “It’s Complicated.” The house from “Hanging Up” is fantastic too. Thank you for posting about both of them! I love Movie Mondays! You have a wonderful (highly addicting) site. .-= Bre´s last blog ..Take it Off =-. They DO look like sisters! I think I like the *real* one even better than than the movie one. My all time favorite kitchen would have to be the Practical Magic kitchen. I used it over and over again for inspiration in the building of ours (not that ours looks anything like that one!). .-= Jessica´s last blog ..Slight Snafu =-. If I could have any kitchen straight out of a movie… it would have to be “Practical Magic”! I love that whole house (and I loved your post about it). It broke my heart that it was just built for a set and then taken down. Ahhh well, the magic of Hollywood! .-= Donna´s last blog ..My 2010 Weekly Planner =-. 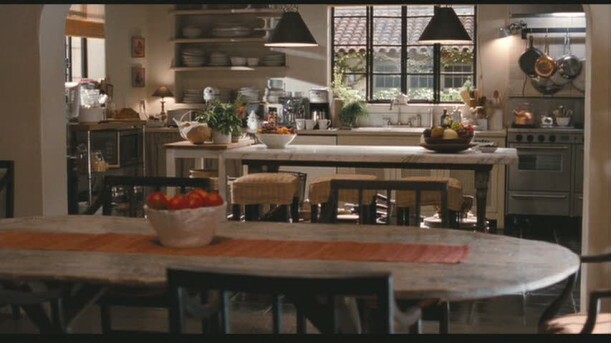 I think right now I would say that my dream kitchen would be very similar to the Something’s Gotta Give kitchen. Heck, I’ll take the whole house! Hamptons beach property?? Yes please! .-= Nancy@marcusdesign´s last blog ..house tour- lisa martensen’s fabulous home =-. Wow I can’t believe how similar those kitchens are. They look so much alike that Wendi must have gotten inspired by “It’s Complicated”. I can’t choose just one kitchen, but when I read your question, the first kitchen that came to mind, was the one from “Stepmom”. I love how after 14 years, the kitchen still looks nice and brand new. I also love the back staircase. Like I said though, there’s so many good kitchens. Wow really similar. Loved that kitchen! .-= Becky @ Farmgirl Paints´s last blog ..journey girl =-. .-= Juju at Tales of Whimsy.com´s last blog ..Yackety-yak- Fairy Tales =-. I just took granddaughter to see Ramona and Beezus, and the reason I loved the movie was that the house looked REAL, not decorated at all. It looked like they filmed in a small two-story craftman style. It was cramped for sure. The living room was small, as was the kitchen. Older wallpaper looked from the 80s was in the bathroom, and the sink had those metal wrap around the sink from way back. But, the house was charming. In the movie, they add on a small bedroom to the back of the house, so Ramona and Beezus don’t have to keep using bunkbeds in one bedroom. They have another little sister, who is a baby. The bedroom they add is small, and when done, the outside wall of the house still has the old shingles on it. The movie takes place in Portland, Oregon. I just thought it neat that this family has 3 girls, but they all share a house that is small and cozy. I think it makes for a closer family. My first house with my two girls was only 900 sq. ft. and so was my second house. What a great kitchen! I’m currently in the middle of a remodel-and will definitely keep your blog in mind-kitchen may be next! .-= Diygirl´s last blog ..Envi Showerhead Reviews by Grandma and Grandpa =-. Love your site. Could seriously spend hours getting ideas here :). .-= Mary´s last blog ..Top 10 Tuesday =-. .-= amber´s last blog ..jamie drake1 by cocokelley =-. Wow, I knew I loved that movie for a reason… Actually, I designed that kitchen four years ago for a lovely young couple living in Southern California. We, too, were inspired by Belgian furnishings and natural textures. Our vision for the entire house was an authentic Provence-style home with Swedish, Danish, and Belgian influences. You would never know it the house is only four years old. Enjoy! .-= Wendi Young´s last blog ..Upgraded- updated- maintained =-. One of my favorite kitchens is from the movie 3 Men and a Baby. I’ve never forgotten that kitchen with all the windows. Spectacular! So glad to find this sight. I love, love, love looking at kitchens.